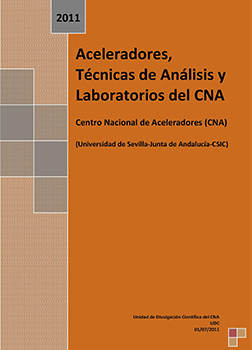 The aim of this book is to introduce the research developed and the analytical techniques available in the Centro Nacional de Aceleradores (CNA), shown their research potential. The CNA is a joint centre of Consejo Superior de Investigaciones Científicas, Universidad de Sevilla and Junta de Andalucía. It is a Singular Scientific and Technological Installation, ICTS, dedicated to interdisciplinary research with ions accelerators. There are 3 ions accelerators: a 3 MV Tandem van der Graaff accelerator, a Cyclotron which provides protons of 18 MeV and deuterons of 9 MeV and a Tandem Cockcroft-Walton accelerator, so called 1 MV Tandetron, which is used to mass spectrometry with accelerators. The applications of CNA accelerators covers fields such as material sciences, environmental sciences, nuclear and particles physics and instrumentation and treatment medical images, biomedical research, between others. Recently, 3 news facilities have arrived at CNA, an ultra-compact system for radiocarbon dating called MiCaDaS, a scanner PET/CT for humans, and a 60Co irradiator. This book was added to our online catalog on Thursday 21 May, 2015.